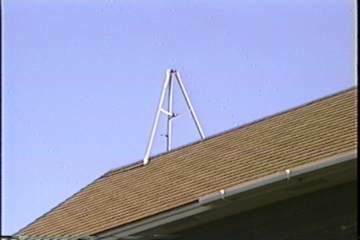 Joe, a good friend of mine has a roof bracket with nothing attached to it. Seems like a terrible waste to have it just sit there and do nothing. A small windmill would undoubtedly put it to good use. 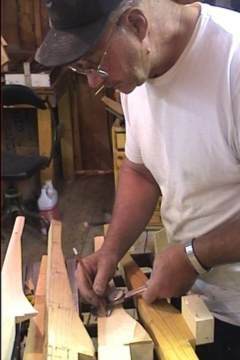 My son Ken and myself have been bitten by the windpower bug, for about 8 months now, and have made 6 small windmills. Some of which, only a mother could love. One mill is such a bummer that as soon as I get time I'm going to saw it to shreds with a chainsaw. Nonetheless, we are challenged to make Joe and his family a windmill. Our goal is to make a small windmill that is fun to watch, and will light up a couple of DC light bulbs. We are posting our project on the internet, so all can see the progress and failures and have a laugh or two. 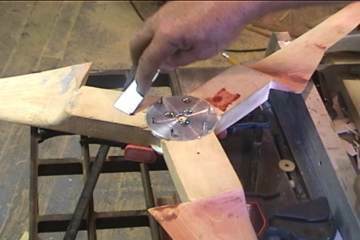 The rotor blades turn faster at the tips than at the hub so a blade must be made with a progressive twist from the tip to the hub. 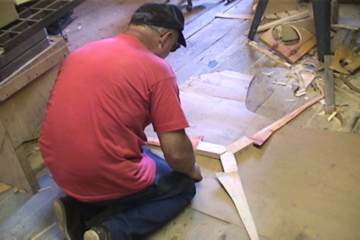 A Blade Designer program from Windstuff Now, got us started at making rotor blades. 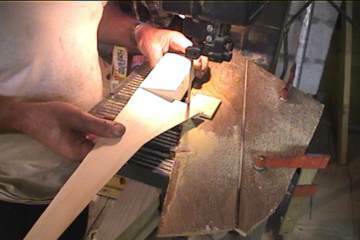 Many lines are laid out and many cuts are necessary to get the right contour. 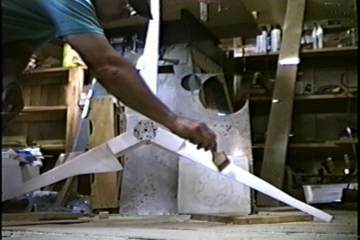 These blades are 54 inches in diameter. 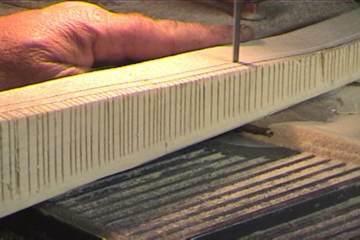 A band saw removes much of the wood, just follow the dotted lines. Vertical lines at the root are deeper than at the tip. 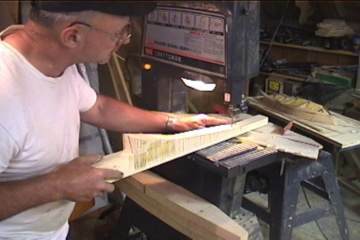 They are sawed every 3/16" and the segments are chipped away giving the blade the proper contour. Ken had to explain this procedure to me 36 times before I got it straight. 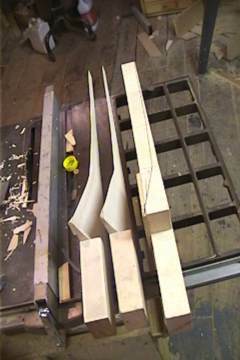 Two blades roughed out with one more to go. Somehow this blade got damaged at the root and had to be repaired. 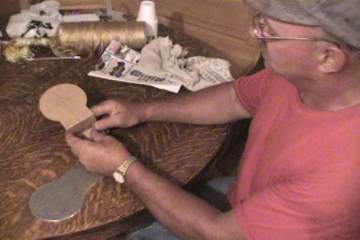 Blades are sanded to give them a smooth finish. 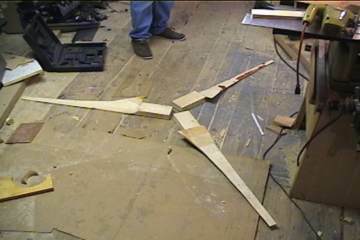 Rotor blades laid out at 120 degrees. What's wrong with this picture?.... They're the wrong blades, these are for a 6 foot windmill. 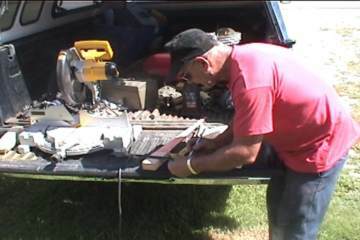 Laying out and cutting the blade roots so they fit tightly to the center point. We first cut a test piece the same width as the blade root on the chop saw and made an interesting discovery; the angle on the chop saw was off several degrees. 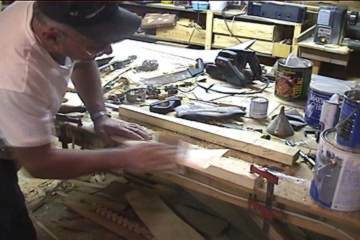 Blades being fitted together for routing the holding grooves. After having one set of blades fly of the hub due to centrifugal force, it seemed like a good idea to make a disc with a 1/4" lip on the outer edge. 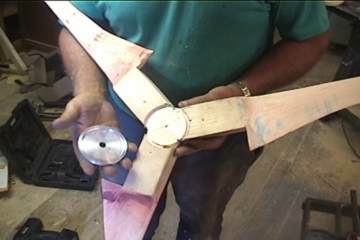 We then routed a slot the same radius as the lip through each rotor blade then bolted the 2 discs to the rotor blades. Hub fitted in place, filling the rough places with glazing compound and auto putty. A cardboard template and a 1/8" piece of aluminum. There will be two bends in the piece of aluminum. We have tested over 40 permanent magnet motors, everything from heater motors to stepper motors to vcr motors. The best one yet, came from an old electric typewriter we got for free. 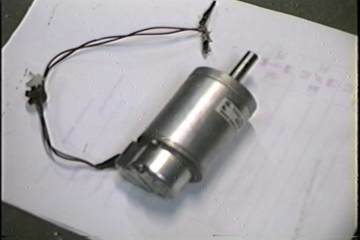 This motor produces voltage at a fairly low rpm, and turns easy. I had to disassemble it to see what made it different from all the others. It has 4 magnets placed at 90 degrees to each other and a fine wound armature and the brushes are 90 degrees to each other. Further experiments are coming to decide if this motor/generator will be used. 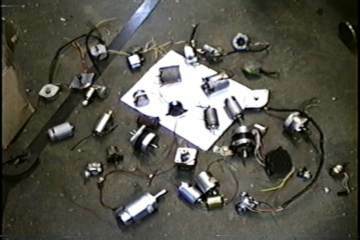 Also, a possibility is to make an alternator out of magnets and coils of wire. Two of our mills have homemade alternators and seem to work well. We've been experimenting with different lenses. 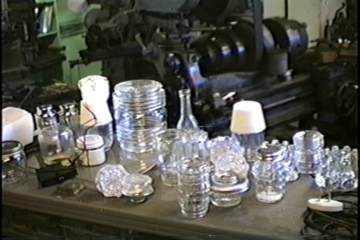 Globes, salt shakers, percolator tops, candle holders, reflectors, bottles, baby food jars and more. We put a small light bulb inside and see what it looks like. 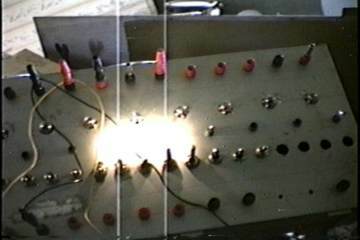 The idea is to make something that is illuminated rather than something designed to illuminate. The technical word for this is "EQIPZYST" After many tests it seems like we've found the lens that that diffused the light just fine. It was one of those transparent water faucet knobs. 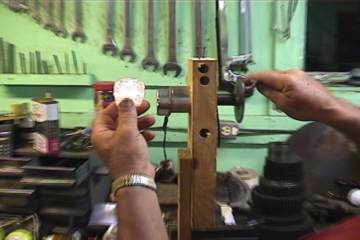 Turning the generator by hand an lighting faucet knob. We made a test panel out of a junk tape player. We installed switches and bulbs to create an electrical load for testing motors.